Staying hydrated is one of the simplest, yet greatest things we can do for our bodies. If wellness is a key priority for you, then making sure that you’re drinking enough water each day is a wonderful place to start. The recommended water intake is 8 cups or 250 ml a day for adults, and should increase the more physical activity you complete. Proper hydration will reward you with many benefits such as a youthful appearance, reduced headaches, and lubricated muscles, to name a few! Your body also relies on water to carry out digestion and keep the immune system strong. Call me crazy all you want, but water is actually my favorite beverage. It’s all I ever ask for when I attend social events (I don’t drink alcohol), dine at restaurants with friends, you name it. Very occasionally, I might treat myself to a raspberry lemonade… but 98% of the time it’s plain ol’ water. I just love how water makes me feel – cleansed, refreshed, and… well, healthy. Haha! Do you want to make water intake a habit but struggle with the urge to indulge in other unhealthy beverages? The following tips will make drinking water more enjoyable. Getting a glass water bottle was probably one of the best purchases I ever made last year. 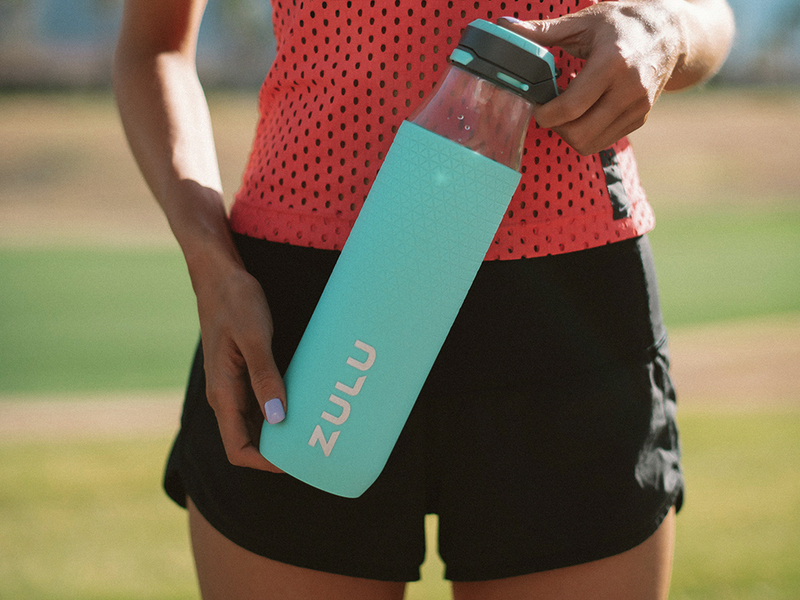 Specifically, my local Target sells these 28 oz Zulu glass water bottles (check stores; the online version is only 26 oz!) that have a lock function to keep my water secure wherever I go. It’s a tad heavy to bring with me to the gym when full, but I got used to it and now this bottle travels with me everywhere – even to the grocery store! I mentioned that a glass water bottle is a must if you want to be fit and healthy before, and it’s worth bringing up again. Ever since getting mine, I never drink water out of cups or plastic bottles unless I’m at a restaurant. I try to mostly drink out of my water bottle so that I can easily track how much water I’ve had for the day. I aim to refill my bottle three times a day (morning, afternoon, early evening) to ensure my body gets enough water. Another big reason why I’m an advocate of glass water bottles is because water tastes SO much better. You don’t get that weird metal or plastic taste in your mouth; water tastes fresh every time. I can drink it room temperature and not feel gross about it! Sometimes when water tastes funky out of a metal bottle, we get discouraged from drinking it at all. Don’t let that happen to you! Another worthwhile move David & I made last year was installing a reverse osmosis system at home. It has saved us soooo much money from buying water bottles, is nice to the environment, and makes water taste pure. Think, unlimited Fiji Water! But seriously though – with a reverse osmosis system, you don’t have to worry about drinking contaminants, any chemicals, or debris that may be present in regular tap water. Maintenance is a breeze. Just remember to check on and replace the filter once every six months or so for best results. Do you find it boring to drink plain water? Get creative and add some flavor to your pitcher! Personally, I love berries and citrus fruits in mine. You can even mix your choice of fruit with herbs and vegetables for an extra kick. Cucumbers and mint are some of my favorites! Feel free to experiment with different combinations and then stick with one that you enjoy most. The longer you steep the add-ins, the tastier your water will be. Make sure to change out the contents each day to keep it fresh. If you find yourself craving sodas often, try making the switch to sparkling water infused with fruit. You’ll get that carbonation and flavor, minus all that added sugar! In addition to drinking water conventionally, there are plenty of water-based foods that you can take delight in for variety’s sake. Not only are they super refreshing, they often come with other beneficial vitamins too. Cucumbers, zucchinis, watermelon, and grapefruit are some foods that are comprised of over 90% water. Whatever you choose to eat or drink, try to be mindful. Yes, drinking coffee and lemonade will give you some water intake, but isn’t totally good for you especially if not practiced in moderation. For many, adding ice into water makes a world’s of a difference in taste. Ice instantly makes water much more invigorating. I find this to be the case especially during the summer because it gets sooooo hot here! Iced water with a slice of lemon quenches my thirst a lot more efficiently and fights any fatigue I may experience on a busy day. In Cameron Diaz’s “The Body Book,” she suggests drinking a bottle of water right when you wake up. She shares that she keeps her bottle in the bathroom so that when she goes in to complete her morning routine, it’s already there, reminding her to drink water. Starting the day with a bottle of water is a smart idea because sleeping for 6-8 hours means you don’t hydrate at night, and it’s essential that you replenish the fluids in the morning. Also, when days get hectic, it’s easy to forget about drinking water. Set a regular schedule that works for you, and you’ll function a lot better throughout the day. Say goodbye to fatigue, headaches, and cramps! How do you make sure to drink enough water everyday? You are so right – drinking enough water is imperative to good health. I find that when I don’t drink enough water, my eyes and skin are super dry, and I get headaches quite frequently. Thanks for sharing this reminder to hydrate more often! I need to get a reverse osmosis system installed at home. Would be a great way to get the kids to drink more water too since they don’t like the taste of tap water and we’ve been trying to reduce water bottles at home. I am with you on that! The dryness is especially bad for me out here in the desert so I have to make sure to hydrate all the time. You and your family will love the reverse osmosis system. It’s been a game changer in our household! I love to make infusions with strawberries!!! I also like lemons and limes on my water. Thanks for sharing these tips with us! I always have a hard time drinking more water recently! Great post babe! I have made it a priority to drink more water, I notice such a big difference when I do! I really need to start drinking more water. So much good information here babe! I have a timer on my phone set to go off every time I need to take a drink and it really helps! These are excellent suggestions! I also use my Sweat app to track the amount of water I drink. I know if I have a goal in the day for how many ounces I’m putting into my body, I’ll be more likely to actually follow through and drink that much – or more! Good for you babe! I love tracking my water on the Sweat app too hahaha so addicting! Love these water tips! I totally agree that a morning workout is a great way to increase water consumption! When I do an am workout I can get 17-32 oz of water in before I leave for work in the morning! Thank you Cierra! Getting a workout in early in the day and having a good chunk of our daily water intake is the best way to start the day! Great tips! I love my glass water bottle. Thanks Molly! Glad you also love your glass water bottle. Mine has changed my life! These are some great tips! I have a problem hydrating myself. I will take these tips as an idea for me to drink more water. The glass water bottle is a great step in the right direction. I drink so much more water now that I have it! I am guilty of not drinking enough water. Some days I barely drink any at all. I want to invest this year in a good water bottle with markings on it to remind me to drink more during the day. I need to get so much better at drinking water! These are great tips I will definitely be using. These are great suggestions to stay hydrated. I have a pretty water bottle and try to drink water throughout the day. Hahaha! Having a pretty water bottle is a great motivation and reminder! Water is very important to all of us to keep us hydrated. And I always make sure that Me and my kids have enough glasses of water every day. Having enough water each day is really important. We could really have a lot of benefits in drinking it. As a mom, I always teach my kids to drink more water and educate them about the benefits we could get from it. Fab tips! I am making more of a conscious effort to drink more water this year. It’s something I have always slacked on in the past. Now, this is very practical. Using a bottle is very effective. Investing in a reverse osmosis system is a great idea, I need to do that! I drink a lot of water, but I think that would be a great next step for me!! It is seriously a game changer! Great tips! I’ll also say that just having a bottle of water nearby you at all times helps too. I used to not drink that much water until I started taking my Hydroflask with me everywhere and I would drink from it all the time out of boredom! this is one of my goals fo 2019 – drinking WAY more water everyday!! Great tips! I definitely need to work on drinking more water!! This is such good encouragement, especially because your tips tackle some things that make me struggle to WANT to drink water. Thanks so much for the New YEar! water tips are so useful. I always have plenty of water in a day. im agreed that we should drink plenty of water in one day. thanks for this post. Such a lovely bottle! Anyway, great tips dear! I love adding fresh fruits and herbs to my water! Makes it so refreshing and much easier to drink! I couldn’t agree more, Angie! Now that you’ve mentioned a glass water bottle, I want one too!! Sometimes I don’t drink enough water so these tips are really helpful. Thank you!! Always important to drink up, and get healthy food! I love water too! I seriously can’t get up without drinking an entire bottle in the morning first. These are awesome tips! That’s so incredible for you babe! Having a great water bottle (with no tastewhen we drink) is definitely a great help! These are great ways to get more water in the day! I definitely need to drink more water daily, I’ll have to give some of these a try! Thanks for sharing!